For the uninitiated, the quarterly Australian Capex data is possibly the most confusing macro release anywhere in the world. But it is a treasure trove of information, which provides one of the richest possible pictures of capital expenditure now and over the coming couple of years. Of course, the usual caveats apply when analysing these data, in particular the forward-looking estimates have become more unreliable (due to increased variability) over time. 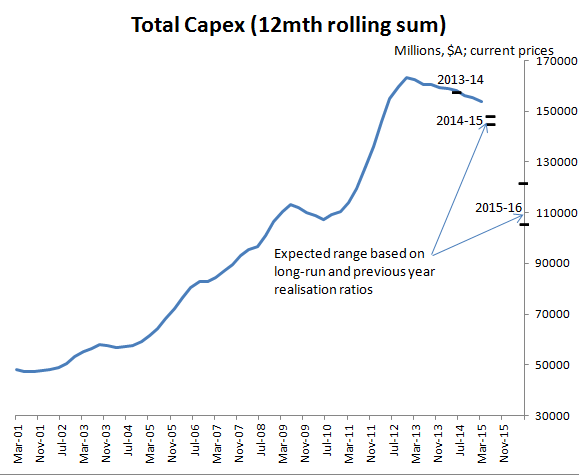 That said, the latest release overnight gives a pretty clear picture: the capex cliff has worsened. Starting with Q1, real capex expenditure fell by 4.4%, significantly more than the street had expected (-2.2%). Moreover, the final forward-looking estimate for 2014-15 (ie including Q2) implies a further decline in Q2 of around 9%! That would leave total capex (from this survey, which doesn’t map one-for-one into GDP) down around 15% yoy through to Q2. 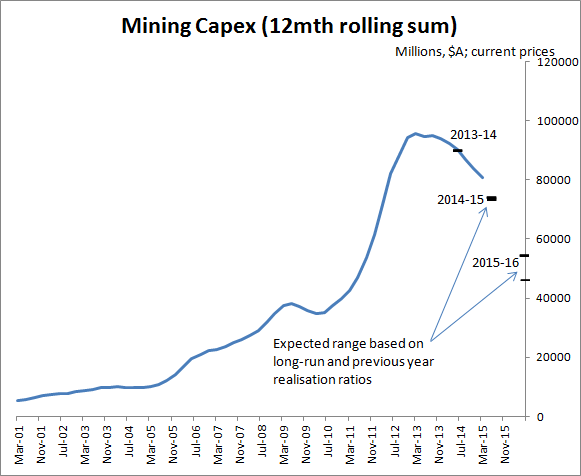 The 2014-15 decline is completely down to the fall in mining investment. This is the cliff we have all been talking about for the last couple of years. The big questions were always: how big will that cliff be; and can non-mining investment rise to offset (some of) it. The answers in the latest forward-looking estimates are that: the mining cliff is even bigger than we thought; and non-mining investment has provided no offset in 2014-15, and looks set to fall in 2015-16. Moreover, the magnitudes here are material. 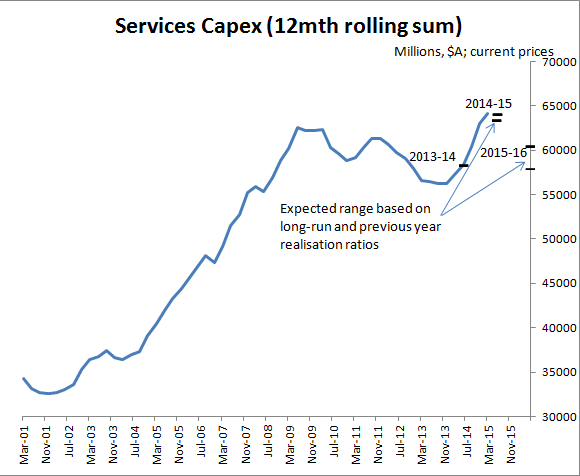 Total capex spending could fall another 20% in 2015-16, equivalent to around 1.5% of annual GDP. Unsurprisingly, the AUD has taken a hit on these data, down around 1% to 0.7644, and heading back towards the April lows of high 75c. The OIS market seems to imply around a 50% chance of a rate cut by August, with a full cut priced by early 2016. The RBA have long highlighted the importance of the non-mining sector investment recovery to outlook. I don’t expect these data will be enough for them to cut rates again next week, but they will bolster the case for a cut in August. I was surprised by how much bonds and AUD railed at the last cut. Today’s data sorted that out. Agreed. Mkt misread the statement IMO. RBA still see scope for further cut(s).